…and I knew right away what it should be! It was love at first sight, really it was! So Todd helped me get it to the cutting table where a conversation ensued about what the fabric should be called. Now this was a most interesting conversation that involved Shaft & Superfly, whether the fabric was a vinyl, a leatherette, pleather or a faux leather. Somehow we even managed to get the 70s drug dealers in there, yeah I think that’s how Shaft & Superfly showed up! I’ve used this pattern before and it’s a pretty easy sew but I did add a degree of difficulty by making it up in the pleather. 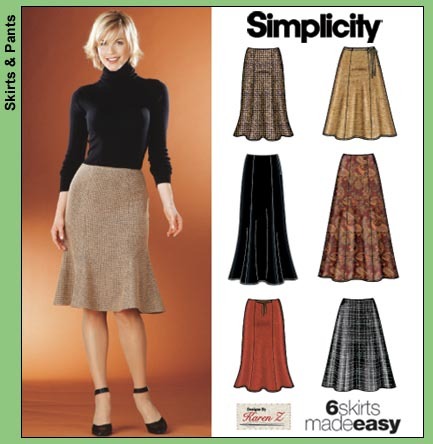 It’s Simplicity 5914 and one of my favorite skirt patterns. At one point I thought about studding the seams but that was just a little tooooo edgy for my day job. Since I primarily sew for my day job, I really want to be able to wear this to work. So I scaled it back but I really like this! – Only pin the fabric in the side seams because the pins will leave marks in the fabric…and I used them sparingly so that I wouldn’t have any issues. – You don’t need to finish the seams because the pleather won’t fray. – Use the correct sewing foot. You can use a Teflon foot to insure that both pieces of fabric move together and don’t drag. However, in this instance because the fabric was felt backed I used a regular zig zag foot. – When pressing the pleather, use a good pressing cloth, a lower setting on your iron and a clapper to make sure the seams lay flat. – I also finger pressed the seams open prior to pressing. It made getting the curves open and to lay flat easier. – This skirt is my on trend dream. Pleather and emerald green are both hot for fall. I’ve managed to incorporate both in one garment. If you’re interested in using some pleather, it’s really fun to use for a garment or to incorporate as embellishments, you can find a great selection on Mood online here. I did line the skirt in a heavier rayon lining that I had in my collection because if I left the skirt unlined the felt backing would have caught on my stockings. Also adding the lining gave the skirt a little heft something else I wanted. There isn’t a hem on the skirt. Since the fabric won’t fray, I just left the hemline with a clean cut finish. I’m wearing it kinda conservatively ~ well as conservatively as you can wear a pleather skirt! It’s for Fashion Fridays at work ~ when the staff dresses down a little and I dress a little fashion forward. It’s an interesting on trend addition to my wardrobe. I don’t sew many casual garments but this pleather skirt will probably see more time out and about for social events than at work. It was a fun sew and something different from what I normally make.